As Hawaii’s premier athletic, social and business networking club, the Honolulu Club offers the finest upscale fitness, sports and spa facilities to our members. Enjoy state-of-the-art fitness equipment, inspiring studios, energizing sport courts and rejuvenating amenities in our 65,000 square foot premium facility. The Honolulu Club offers the best equipped fitness & lifestyle club around the islands. Our 20,000 square foot fitness floor houses the latest generation Hammer Strength, Life Fitness, Synrgy360 and Hoist equipment in addition to many free weights, sandbags, kettlebells, ropes or other accessories. The Fitness Center offers 65 of the newest Life Fitness, Matrix, Octane, Precor, Free Motion and Concept 2 cardiovascular equipment. Additionally the Club has over 10,000 square feet of open air, rooftop training space that offers members a unique and invigorating training experience. In its well-equipped and efficiently designed studios the Honolulu Club offers over 100 exercise classes each week. The large variety of classes will make it easy and fun for you to stay fit and healthy. 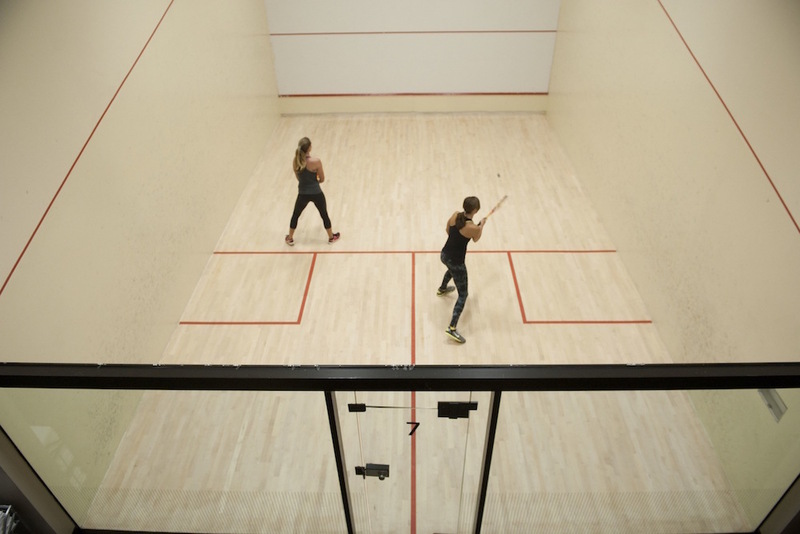 The Honolulu Club is home to Oahu's only indoor racquetball and squash courts. And table tennis fans will love the Club's dedicated indoor table tennis room. Enjoy challenging your friends and improving your skills on the Honolulu Club's indoor courts. The Pilates Studio offers everything the Pilates-heart could wish for. With Balanced Body equipment and an open, relaxed and tranquil atmosphere, the studio is the ideal location to perfect your posture, flexibility and strength with the coaching of our highly-skilled instructors. The rooftop is a place where you can perfect your forehand, backhand, overhead smash, serve and more. Whether you play with a partner or get a lesson, the tennis court is available for you. The Honolulu Club is also equipped with a basketball court with efficient lighting to play before sunrise or after sunset! Shoot some hoops or battle some friends in a 3 on 3! Looking for a place to work on your swing? The Honolulu Club offers the ideal rooftop driving range station where you can practice to perfect your game. Our heated, outdoor pool provides a comfortable exercise and training experience. Our well appointed locker locker rooms offer shower facilities, toiletries and towel service. And both locker rooms are equipped with a steam room, sauna, hot tub and cold plunge to truly relax after a workout or just to enjoy. Interested in experiencing our state of the art facilities for yourself? We're thrilled to show you all the Honolulu Club has to offer. Simply complete the form below and a membership advisor will be in touch with you to set up a free tour and trial. Thank you for your interest in the Honolulu Club! A membership advisor will be in touch with you shortly to set up a personal tour and free trial.